in FADING GIGOLO. Photo courtesy of Mongrel Media. He doesn’t actually. But he has known Fioravente since he was kid and walked into Murray’s store and attempted to steal from him. And he knows he needs the money. And thus we have the beginnings of an absurdist comedy. Sharon Stone and her friend Sofia Vergara need to hire a male prostitute, Woody Allen has become a pimp, and John Turturro is playing a prostitute as the straight man to all the comedic goings-on. But wait, there’s more. Murray is quite enjoying his life as a pimp and attempts to get more clients. So he approaches a lonely widower in an Hasidic Jewish community in Brooklyn and persuades her to start seeing someone who “is more than a rabbi.” This gets funnier when Murray and Avigal (Vanessa Paradis) are stalked by a Shomrim ultra-Orthodox Jewish patroller, Dovi (Liev Schreiber). Liev Schreiber (Dovi) in FADING GIGOLO. Photo courtesy of Mongrel Media. The film becomes like a four-part story: Pure comedy with Woody Allen working as a pimp in typical Woody Allen fashion; comedy-drama mix with Stone and Vergara exploring their sexuality; drama-romance mix with Paradis and Turturro learning about themselves and finding love where they probably shouldn’t; and then a comedic crime caper with Schreiber uncovering Allen and Turturro’s prostitution ring and enforcing Jewish religious law. The film starts off with hilarity and Woody Allen delivering the type of one-liners you would expect to find in one of his own films. Turturro appears to have a lot of respect for the veteran filmmaker and has modeled his own film after Allen’s style and has given him the opportunity to shine in comedic material which he has rarely given himself. One scene for you to anticipate involves Woody Allen teaching a group of Hasidic Jewish kids how to play baseball like Kevin Youkilis. The scenes with Stone and Vergara definitely slowed things down significantly and Turturro’s time as a pimp is arguably the least entertaining moments of the film. But then we’re introduced to Paradis, and although her role was drama, it added a more human element which was missing. A pure absurdist comedy would have been fine without the human element, but after some drama was introduced, it was definitely needed. A large part of the strength of this film is the ensemble cast that Turturro has assembled. Sharon Stone and Sofia Vergara playing women who are exploring their sexuality and need to hire a male prostitute is a joke in and of itself and sets up the absurdist nature of the comedy. 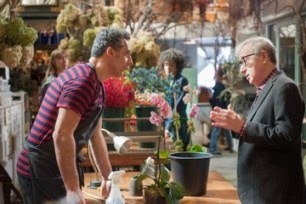 Woody Allen is the comedic star of the film and offers laughs every second he is on the screen. Vanessa Paradis holds the heart of the film as a beautiful but lonely and repressed Hasidic Jew widower who slowly experiences life outside her conservative culture. And then comes Leiv Schreiber who is hilariously subtle as an Hasidic Jew holding up the religious law of his society. This involves kidnapping Woody Allen and taking him to Hasidic Jew court, where we then get to see Bob Balaban as Allen’s lawyer. The inclusion of the Shomrim and the Hasidic (or possibly Haredi) Jewish court was really well done and was a clever way to bring Allen and Turturro’s prostitution ring into a form of reality, comedic reality. “Fading Gigolo” is an absurdist comedy, and as a comedy it is very funny.